One thing I love about design for the home is that there is always a challenge (some people call them 'problems') to solve. One of my clients is looking for a solution for their bathroom window. The window faces a boardwalk, so the window treatment needs to provide for privacy. But, since the window doesn't need to be closed to views from outside all the time, it needs to have a quick and easy way to adjust light coming into the room. 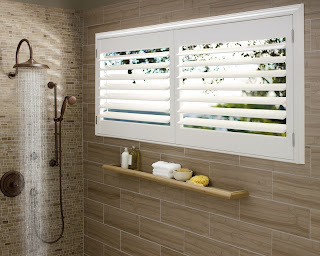 Lastly, because the bathroom has various degrees of humidity during the seasons, it should be a window treatment that can hold up to the wettest of conditions. Problem solved: Since I recently attended a seminar featuring Hunter Douglas products I recalled that their Palm Beach Shutters might answer all the challenges on our list. With a guarantee to "never warp, crackle, fade, chip, peel or discolor" I think we may have an answer that not only works well, but looks great for years to come!